“Being an entrepreneur is a lot like being in love: you’re totally into your work and want to spend every waking second with it. However, as anyone who’s ever been in love knows, at some point the honeymoon is over. And as any marriage counselor will tell you, that’s when the hard work of a successful marriage begins.” ~ Arlene Dickinson. If you are an entrepreneur you know that it is an all-encompassing lifestyle. And no one understands this better than Arlene Dickinson, venture capitalist and host of the acclaimed award-winning CBC show Dragons’ Den. 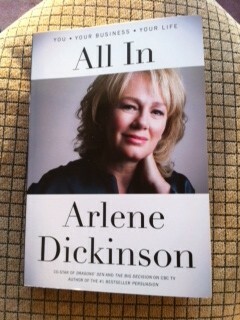 In her latest book, All In, she lays it all on the line for entrepreneurs, and helps them identify and confront their daily demons. Whether it’s facing fears of guilt, rejection or balancing personal and professional lives, Arlene shares firsthand experiences and stories from other entrepreneurs who have been there in the journey of trying to live up to their dreams. 2. Be present wherever we are. Avoid constantly checking emails at the dinner table. 4. Evaluate any major decision by carefully considering what might be the worst thing that they could happen. Consider future regrets. 5. Incorporate fitness into our schedule. Did you know that most successful entrepreneurs are either addicted to it or find a way to include it into their hectic life. 6. Remove emotions from the equation, and mistakes will become opportunities for learning, not self-punishment. It’s the best way to recover and move on quickly. 7. Stay grounded if success taps you on the shoulder early. 8. Demonstrate unshakable self-belief. Just take a shot and see what happens. There is a key takeaway from the book that is all the more relevant today than in generations past. In the globalized marketplace of 2014, the entrepreneurial ethos needs to be embraced more strongly than ever. Competition is fierce from large corporations at home and abroad, yet those big companies are never the incubators of innovation; entrepreneurs are the life blood of an economy. All In shows that entrepreneurship isn’t a cloak we can put on and take off when we desire. It’s woven into our creative thinking and daily being. Arlene Dickinson’s book is an accessible read, free of management consulting doublespeak. It is a book that helps you Think Blink about the challenges of the entrepreneurial life and as 2014 dawns, we are all in on that sentiment. Does Arlene Dickinson have any advice to those ‘forced into’ entrepreneurship? I ask because the belief is that one is, in a sense, born an entrepreneur and that there needs to be ‘fire in the belly’ to drive and propel a venture forward. Given the numerous obstacles, many start ups cease to exist within 5 years of inception: such is the nature of our market economy but now global dynamics are such that many people find themselves mid career with a decision (after being downsized and laid off): do I go it alone as ME.INC or do I continue to look for gainful employment in an increasingly competitive environment.